ようこそ！ Bienvenue! 에 오신 것을 환영합니다! 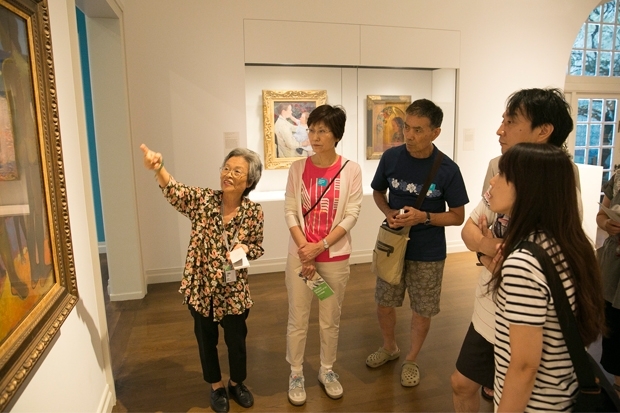 ​Docents are dedicated volunteers who welcome museum guests and offer them tours of the museum’s 30 galleries and six courtyards. Docents usually serve one morning or afternoon per week. Successful applicants will attend an introductory training course, taught in English, to become familiar with Asian, Western, and Contemporary art history, specific works of art in the museum’s collection and specific techniques to encourage visitors to engage with the art. Following the initial training, all docents are invited to participate in weekly continuing education opportunities that include curatorial lectures, workshops, and training session as well as social events with more than 185 other docents. Learning about art and sharing it with others through the docent program is an exceptional—and gratifying—educational opportunity. The bilingual training course will be taught one afternoon a week for six weeks in late July and August 2014. Training for school tours will begin in January 2015.For more information about the docent program, click here, or contact Betsy Forrest Robb, Curator of Education, at 532-6075 or gro.muesumululonohnull@bborb.